Behemoth Sauvin Slayer. I planned on having this on Friday Night, you know start the evening off with a bang and it goes well for me. Turns out that I didn’t actually buy this beer on Friday and so this is a day late and story later. … will take you to the other side.. 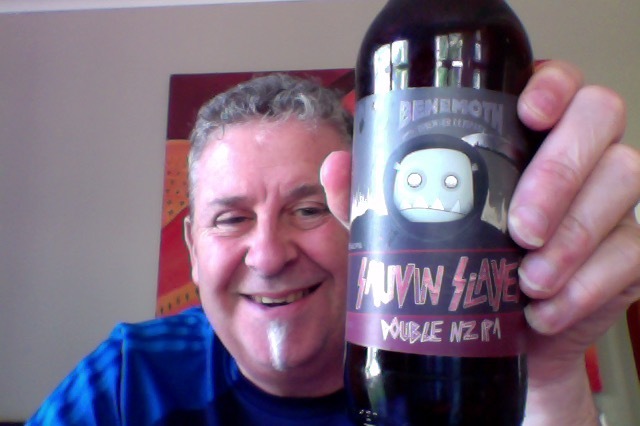 This is a 500 ml bottle of a beer that is 8% ABV, and 75 IBU, this would be 240 calories a serve size, and this would be 3.2 drink units in NZ. All Nelson Sauvin Hopped Double IPA… here to collect hop heads! Big Dank NZ hops will take you to the other side of hoppiness! Well apart from getting excited over a beer that I thought I’d brought and hadn’t who knows. A beer that has a huge grass aroma on opening, be disappointing it if hadn’t. Bright yellow orange pout with a lovely full head, that lovely Sauvin hop aroma that I really quite like. Dialled up to 11 bitterness there is no holding back on this one, if anything it’s undersold. Bitter tropical and not so tropic fruit such as gooseberries are the core of this, but it really is that intense beer bitterness that is dominant. Surprisingly though it is quite pleasant at the finish and not dry or crushing on the palate. But it’s not quaffing beer, on no, no sir. Not sure that this was the best choice for me on a Sunday afternoon, or perhaps it was, because on a one beer day this is pretty much a great choice. The aroma is something that I have to mention again, if you like this hop variety then this aroma is magnificent. I didn’t know that it’d be this bitter, and that then shows that the brewer is on top of his game. The pdubyah-o-meter rates this as 8 of its things from the thing. It’s not quite clear cut to be very good, it’s very close but I don’t do fractions that often and if I did it’d get confusion quickly, like my use of English at times. It’s better than good though. Where did I get it? The local Liquorland had it, but good places would have it. Am I enjoying it? I am it’s quite the thing to have a big hoppy beer as your one beer. Would I have another? Which is odd, because no, there are other big hop beers to have. Would I share with a friend on a porch and set the world to rights? I might because there are other less hopped beers using this variety and it’d be a lovely side-by-side to be able to compare the use and outcome. That’s a beautiful looking glass of beer. And where are the pictures of this alleged bikini body??? 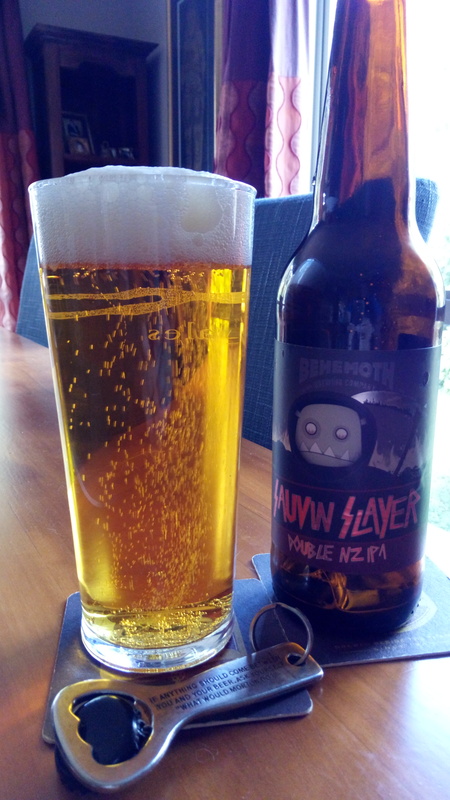 This entry was posted on December 11, 2016 by Philip Walter in Beer, Beer of New Zealand, Beer Review, Behemoth, Craft Beer, Critic, Imperial/Double IPA, Justsaying and tagged Behemoth Sauvin Slayer, craft beer.